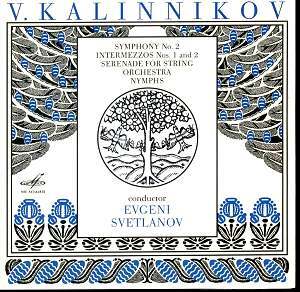 It’s the First that’s the more performed and admired but Kalinnikov’s Second Symphony has warm-hearted and lasting virtues of its own. And in a powerful performance such as this one, recorded in Moscow in 1968, those qualities of lyrical ardour and masculine dynamism are as evident as ever. Which is not to say that the Svetlanov traversal is the last word in, say, orchestral refinement but against such minor limitations can be ranged persuasive levels of energy and good old-fashioned fossil fuel when it comes to the heart of the matter. Kalinnikov was not one to hang around on an orchestral exposition when he could get into the second subject with alacrity – which is what happens here. Svetlanov, as much as he did in his similarly felicitous recording of the First Symphony, brings a wonderfully raw intensity to the lyric feeling and to the folkloric elements alike. Certainly the 1968 sound has a whiskery old roughness to it – maybe not inappropriately if you want to be charitable – and that suits the gruff old fugato in the first movement. Fresh exuberance is the name of the game despite the echo-y acoustic. Svetlanov plots an astute course throughout – the rise and fall, the arc of the slow movement and its symmetry in particular. The Rimsky influence is suggestive but not made bloatedly obvious. The elegantly bucolic moments in the scherzo, with its delightful trio, are similarly verdant commodities of value. If the finale, after its brief lyrical introduction (shades, symmetrically speaking, of the opening movement’s exposition), doesn’t quite live up to expectations then there are compensations; the brash confidence of the writing brings its own rewards. The remainder of the programme was recorded many years later in 1990 but that pervasive studio echo is still there. Svetlanov doesn’t over-inflate the Intermezzos, both written at around the time Kalinnikov wrote the Second Symphony. There’s the same eager lyricism and proud folk lilt to the writing in the First Intermezzo. In the Second the writing is rather more stentorian and perhaps less likeable as a result. The Serenade is a rather earlier work. It has a pleasant patina – but its waltz profile is rather repetitious and the Tchaikovskian elements that animate it are stifling. Finally there is Nymphs (1889). Though earlier than the Serenade this is a much better work – it’s dramatic but has a terpsichorean grace and a lusty central section that compels interest. Kalinnikov’s rhythmic rapacity is keen here and this is an unexpected pleasure. A slightly different perspective on the Symphony comes from Neeme Järvi and the Scottish National on Chandos – broader in the opening movement and tighter in the Andante cantabile. But as for the current disc these are, as one would expect of Svetlanov, direct and powerfully energised performances, dedicated to exploring Kalinnikov’s melodic and rhythmic strengths. Those sympathetic to such things will find that this revivified Melodiya hits all the right emotive spots.